Woodmansterne Baptist Church is a fellowship of approximately sixty members. We started as a small fellowship of believers who met in a room over a hardware shop in Coulsdon in 1907. Numbers grew over the years and the Church became a member of the London Baptist Association in 1932 and eventually purpose built the Church premises and settled into life in Pine Walk, Woodmansterne in 1936. 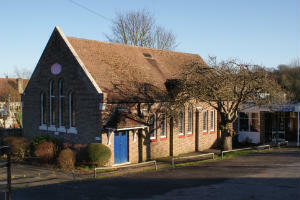 These premises have been extended over the years in particular because of the growing number of people who have attended the Church.